Buzz Lightyear. Woody. Rex. Slinky. Mr. Potato Head. Andy and his toys. His friends. You probably get an immediate image in your head when I mention these names and you’re not alone. I dare you to find anybody who doesn’t know who these Disney characters are, and that is in part due to the fact this 90s blockbuster was the first of its kind, was truly heartfelt, would touch several generations of people, and would change the look of animated films forever. Period. Don’t argue. If you are reading this, then you have seen at least one of these films, driven by PIXAR. You know Tim Allen, you know Tom Hanks, and you know Randy Newman’s silly voice singing all the silly opening songs. I must tell you here and now that I will be focusing on the overarching themes and impacts of the trilogy which took fifteen years to come to fruition. If you haven’t seen Toy Story 3 (2010) then please go see it before you continue any further—unless you want my opinion of it first. Here is my opinion: go see it now! Especially if you grew up with copies of the original or the sequel in your home. You owe it to yourself to cry with Andy. 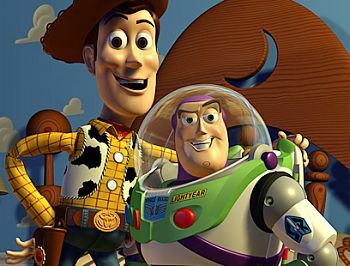 The Toy Story films are more than original; they were the first to animate and personify toys, which is brilliant when your audience is kids who love toys. Duh. Secondly, you have not hand-drawn art, which I do love, but rather exclusively computer generated images for the first time. No drawn art, no live shots of people or objects. This movie was made entirely in computers. Many computers. And this created new challenges, opportunities, ways of editing and directing, and new hurdles in creativity and sound design. If you could dream it, you could probably make it happen, and you don’t need to damage anything or anyone. You don’t need stunt doubles. None of the “Actors” need coffee or “pee” breaks. They’re digital!!! And if a particular take doesn’t quite hit that facial feature you were looking for, there is no need to call back in the actor for a re-shoot, simply open the program, and make the smile on Woody’s face bigger or more shallow. Kind of crazy when you think about it. Besides the technological advancements which many are already aware of, what of the cultural impacts? How did this family movie become one of the most important films of the twentieth century? Firstly, it was the themes and the story being told. Without that, it didn’t matter how great it looked. It would be seen as a little fluke, as a small movie with fancy graphics: nothing more. But the story was relatable. The characters diverse, and the morals and motivations of the main and supporting characters were things the audience had dealt with in the past or would deal with in their youth. Betrayal, fear, loyalty, being parted from loved ones, putting aside differences to get back “home”, and most importantly, love. Had this animated franchise been about “Cars” or “Tall blue creatures”, they would be easily forgotten. But a child’s youth and innocence are not easily forgotten. Family, a good one, reigns supreme. These emotional responses are deep-seeded, and frankly, genius of the filmmakers to tug on. Brilliant. 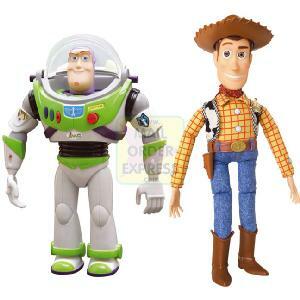 In 1995, Toy Story was released to theaters in November. The marketing and advertising was genius. The movie makes it own path for merchandising: Toys. For god’s sake, how easy is that? Just make the toys that are in the movies and sell them. Bingo. This continued for over a decade; through the 1999 release of Toy Story 2, arguably, the weakest in the trilogy and least satisfying of the three. Regardless, the characters popped up in Disney land and Disney World, and soon there were shoes, socks, t-shirts, lunchboxes, pencils, folders, sleeping bags, bed sheets, plates and plasticware—all dedicated to the money maker. I don’t mean to make it look as if they only cared about the money. I really mean to show that the films were so enjoyed by the public that all this crap was actually demanded for and sold very well. People loved these characters since the films had something for kids as well as teens as well as the parents. Disney has always been pretty good at creating films which don’t placate to solely children, since they realize “hey, the parents are going to be in the theater too. I guess we shouldn’t torture them.” Lion King and Aladdin are good examples of films with a higher level of quick wit and suggestive charm aimed at appeasing the 30+ yr. old chaperones. Without fail, a third film would come, but not for eleven more years. I admit, when I first saw that huge blue and yellow number “3” on the movie poster at my local theater, I was bemused and skeptical. Why had they waited so long? Is this necessary to the overall story or is this just to make money? The answer is both! I decided to skip it in the theater and see the film first thing when it came to DVD. There was a huge fuss over the film while it was in the theater and I wanted to understand what the fuss was all about. The fuss was that it was just as good as the first film, and it was the end. Those words: The end. I hadn’t even thought about it. Apparently, the writing team did. 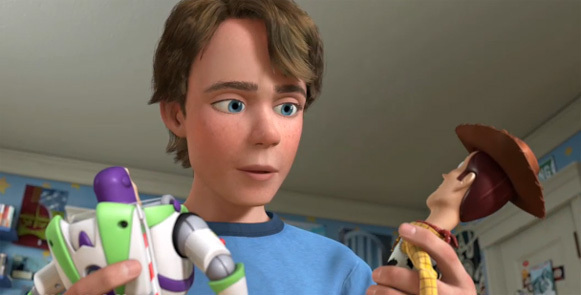 We all grew up with Andy and these characters and this was a warm and affecting movie in which we say goodbye to the films and the characters just like Andy must say goodbye to his old toys. We’re all moving on and Andy is going to college. The time between the second and third film was well thought out and paid off… big time. I will say that I am surprised this film got a “G” rating and not a “PG” rating. Films like “Finding Nemo” and “Tangled” are PG (could’ve been “G”), but Toy Story 3 is rated only “G” and has a pretty terrifying scene where the toy are literally all about to die and are holding hands. That was one of the saddest scenes in a Disney film I can remember, and would probably upset some kids. That is PG to me, and this film was heavier at times that a “G” should be. Let’s move on. 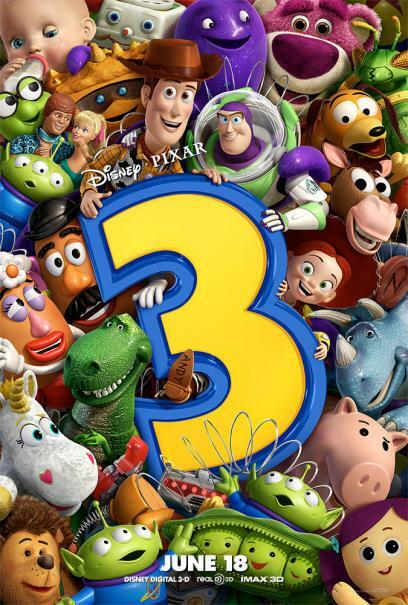 While Toy Story 3 was not flawless and suffered from some weird scenes and a drag in the end of the second act, the film is a must see. “A-” film at best. Some argue that that is too high of a score and that were getting our emotions confused with how this film is as a “stand alone.” I respect that you could say that about any film that is part of a series, but this is different. I say let your emotions and connection to the past films get the better of you. Is this a good film? Yes. Is it a great film? Award-worthy in more respects than just special effects? Only if you let your emotions get the better of you, which is one of the reasons I believe it was up for “best picture” in the 2010 Academy Awards. This was not going to win that category, but I understood that its inclusion was because it was the end of an era and was a tip of the hat. This films is probably not a masterpiece, but goddamn, our hearts sure think it is! I cried at the end of 3. Don’t tell anyone. In the end of the day, this was the best Disney trilogy made so far, without question. Many sequels and trilogies by Disney, as you may unfortunately know, go through different director’s hands, different calibers of writers, and sometimes are direct to DVD. Never a good sign. Toy Story on the other hand is a remarkable success story which was given the red carpet treatment from day one; years of development went into making the first one. 800,000+ hours of frame capturing. Wow. I deeply recommend checking out at least the first link below the ratings, which takes you to graphs showing voters vote on their top trilogies or series. 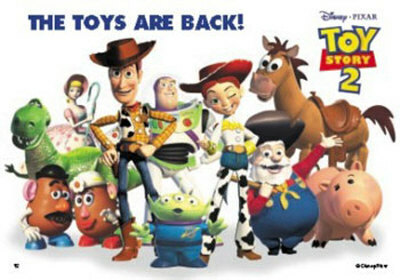 Toy Story is always up there with Star Wars, Indiana Jones, and other classics.